There is some pretty obvious ones for this category most notably Mario and Princess Peach as-well as Link and Princess Zelda. Man I want to be in a computer game if I get a shot at a princess.\n\nMy choice isn”t exactly conventional as one of the characters isn”t even living being as such. 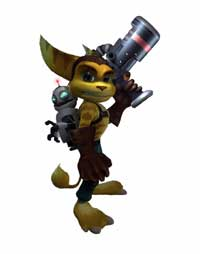 But my favorite gaming couple are Ratchet and Clank.\n \nI think its the way that they work perfectly together, Ratchet being the character that the user controls the most with the heavy firepower helped all along the way inspector gadget style by Clank who perform various jumping, hovering and diving abilities which where upgraded from the very first game and then continued through. I especially enjoyed the levels where you took control of Clank to get into small holes or hover across space. So although they”re not the most conventional couple, they share the same assets as a normal couple would. Teamwork and Respect for one anthers abilities.